State law prohibits the disposal of e-waste (computer monitors and hard drives, laptops, TVs, including CRT, LCD, and plasma, and similar video display devices) in your regular trash. Call Waste Management’s customer service center at 800-972-4545 to make an appointment for free pickup of e-waste. E-waste collection events are also hosted by the RI Resource Recovery. 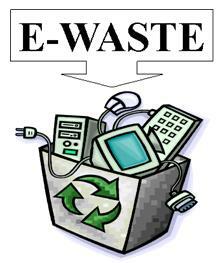 Visit www.rirrc.org to find out more on e-waste disposal.